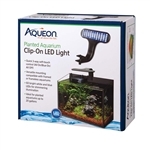 The Aqueon Planted Aquarium Clip-On LED Light is a convenient and affordable options to add LED lighting in any aquarium. These elegant super thin Clip-On LED lights hover over the aquarium, providing optimal lighting for a bright thriving environment. Soft-touch switch LED, easily mounts on framed or frameless aquariums using versatile mounting screw. The 60 bright LEDs help support and grow lush plants. Ideal for planted aquariums up to 20 gallons. Soft-touch switch LED control. The 3-way switch moves from All On to Blue On to All Off. Peak PAR=63. Avg PAR=35. Peak LUX=3722. Avg LUX=2188. The average output is at 12" from the center of the light in a 16" X 16" area. Light dimensions: 8" X 2.75"
The clip that attaches to the back of the tank expands to a maximum of 3/4"